Enjoy for old times sake. I have to agree with him. Next to her RNC speech, this was probably Governor Palin’s second most rousing and inspirational speech. In my opinion, her Iowa speech would come in at a close third. No one can stir and motivate a crowd like Governor Palin can as she espouses the conservative principles that made this nation great. There was a fast and furious response by the Left to Bristol Palin’s blog post in which she expressed her disagreement with President Obama’s stance on gay marriage and emphasized the double standard applied to the manner in which he claimed to have arrived at his decision. Blog posts critical of Bristol’s statements flooded the Internet. Bristol was attacked on Twitter and in the comments section on her blog. Death threats were posted in comments on her blog and on Twitter. Michael Sheppard and Jackie Siciliano exposed one such perpetrator of hate, a college student who supports Obama, here and here. John Nolte wrote here about violence against Bristol being promoted on the Facebook page of Magnet Releasing, a film company owned by Obama supporter Mark Cuban. Tony Lee wrote here about the Hollywood intolerance reflected in Bristol’s hate mail. This was an obvious effort to overwhelm and silence a dissenting viewpoint from that of the Left and their Dear Leader. It appears that only the Left has First Amendment rights in this country. At least, that is what they would have us believe. However, the last time I looked, the Constitution and the Bill of Rights were still the Law of the Land. And may they ever remain so. We at SPIB would like to give Bristol a shout out for the courage and strength she has displayed in the face of these attacks. We stand in solidarity with her in support of the moral principles that made our country great. So let me get this straight – it’s a problem if my mom listened too much to my dad, but it’s a heroic act if the President made a massive change in a policy position that could affect the entire nation after consulting with his teenage daughters? Well, I stirred up a hornet’s nest. You know you’ve struck a nerve when even J-Woww tweets insults at you. But the thing that most amazes me is how few people actually addressed the points I made in my recent blog post. They were pretty simple. Conservative women like my mom get grief because people think they can’t make decisions without their husband, but Barack Obama gets applauded for changing his mind on a huge issue after consulting his wife and young daughters. The double standard amazes me. Oh, and in that post I also said generally kids do better with mother/father families – the kind of family I’d like to have for Tripp one day. That’s it. That’s pretty much the post. (Yes, I made a little joke about Swiper the Fox, but anyone with a brain would know that wasn’t serious.) You see arguments like that all the time in political magazines. It’s not a big deal, and the people who make arguments like that don’t stir up much controversy. But I’m not a pundit. I’m just a mom made famous in one of the most intense and embarrassing ways possible – by having your teen pregnancy announced in the middle of a presidential campaign. Oh, and I was a finalist on Dancing with the Stars, one of the most-watched shows on TV. But all that means I’m more a part of pop culture, the culture that creates the television we watch and the music we listen to. When real pundits write blog posts, they don’t pop up in Us Weekly… but mine do. If you read the almost 3,000 comments after my controversial post, or read the entertainment magazines, you’ll see some of the most terrible words against me, my mom, and my entire family. As early voters go to the polls today in Texas and tomorrow in Nebraska, Governor Palin reminds them to vote for Ted Cruz and Deb Fischer, whom she has endorsed. You can learn more about Deb by visiting her website at http://www.debfischer2012.com and following her on Facebook and Twitter. You can learn more about Ted by visiting his website at http://www.tedcruz.org and following him onFacebook and Twitter. Nebraska senate candidate Deb Fischer has gone from a 16 point deficit in second place to a 5 point lead. This whilst pollsters advise she still suffers from a degree of name recognition. 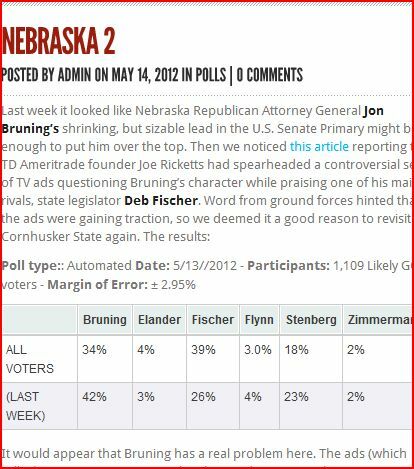 This massive turnaround in one week comes directly after Fischer was endorsed by Sarah Palin, who is also doing a robocall for her. 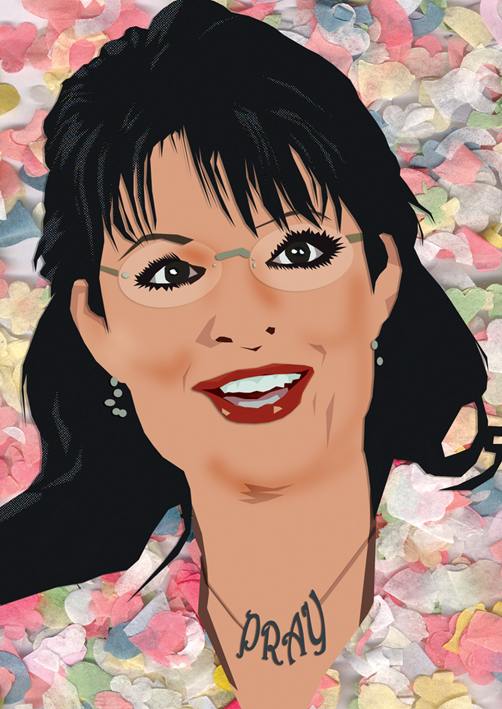 Palin’s endorsement was subsequently followed by other high profile local politicians. If Fischer wins, following on from the win of Palin-endorsed Mourdock in Indiana last week, who could but agree with Palin that she doesn’t need a title to make a difference?